“Games are just games aren’t they, all the same thing?”. Wearing my Director of LAMP hat develop and training industry producers (working through the Australian Film TV and Radio School) I come across many traditional producers of media who just don’t ‘get’ games. They look at them through the corner of their eye in that slight crack that has appeared in the ‘mass-market, controlling-author’ blinkers they wear. I am being deliberately confrontational as this is a real and present danger and challenge for the linear TV and Film industry and those purporting to educate for that industry. On one hand they say we make films and TV because it is a mass audience and that means money up front and new media has no proven business models yet when you mention that games are actually as big if not bigger revenue generators they give you a look of “oh yea sure” or “so what, I don’t want to make shoot’em ups for kids”. Ummm. I am not going to make the case here for any side so will leave that to Terra Nova and as regards the games business then have a listen to a podcast I posted on the LAMP site from Luke Carruthers, here. No this is more about the games universe – that vast range of ‘play’ that constitutes the highly prejudiced word, games. The games universe is big. I am always surprised at growth of the list of latest genre and sub-genre of games particularly across the many online game distribution portals that I am a member of. So I am not going to do a long list of (a) games genre (action adventure etc:), (b) mechanics (first person shooters etc:) or (c) the many game theory taxonomies (sequential, simul, non-zero sum etc:) but something more simple. AFTRS is about to launch a range of ‘cinematic’ games courses – a particular focus on story, character and narrative. Related to this LAMP ran a seminar last week (which is now podcast – follow the next links) at Museum of Sydney that I called “Living the Story”. Jackie Turnure, a colleague, did a great games film overview and we were lucky last week to also have Deborah Todd over speaking at this event and helping us plan and think about what is going to be good for the games industry but also unique. Deborah wrote a great accessible book on Game Design – From Blue Sky to Green Light. During a brief planning meeting I/we drew up the simple diagram above as an accessible way for non-gamer types to get a sense of the scope of the industry. The diagram attempts to show several things which are all open for comment! 1 The two axes are immersion. 2 The y axis immersion is based on how much is spent on the ‘experience environment’ or the production value. So the better the sound, vision, narrative, characters and mechanic then potentially it will be more immersive – think Shadow of the Collosus on PS2 vs Tetris on a mobile phone. 4 The size of the bubble is meant to suggest audience/market size (and is probably the most contentious) so think of this as illustrative, please. 5 Then there are the distribution platforms – locative, PC or dedicated console. This explains why AR Games (alternate reality) have a big foot in locative. Well it is a first stab. One thing that is obvious is the semantics and naming here. Console games for example refer both to the platform they are on but in the industry also suggest that they are a triple A title – the feature film equivalent of games, delivered on consoles and PCs. Hence that paradox of console games on PC. We also have terms that feel like genre, serious, casual, but again refer to a broad range of sub-categories (in other words you can have a First Person Shooter, Action, Serious Game). Disclaimer: The above represents my personal views and not that of any employer. Interesting first stab, Gary. Thanks for posting this. Personally, I believe it’s possible to inhabit not only a game’s story, but a game’s rules system. I can become immersed in the storyworld of Shadow of the Collosus on the PS2 just as deeply as the rulesworld of Tetris on a mobile phone. Think “roleplaying” versus “rulesplaying”–enjoyment and immersion can be the product of each, separately or in combination. Before computer games were graphical, text adventures seemed to do a great job at submerging us into interactive storyworlds. There have been plenty of games over the last 25 years which have had simple or primitive or even abstract presentation, but have provided an immersive experience. As John Buchanan said at the last LAMP earlier this year, better sound and graphics don’t make a better game. What I’m adding is that a game’s quality relies on its story, and/or its rules: Shadow of the Collosus is good for different reasons than Tetris. 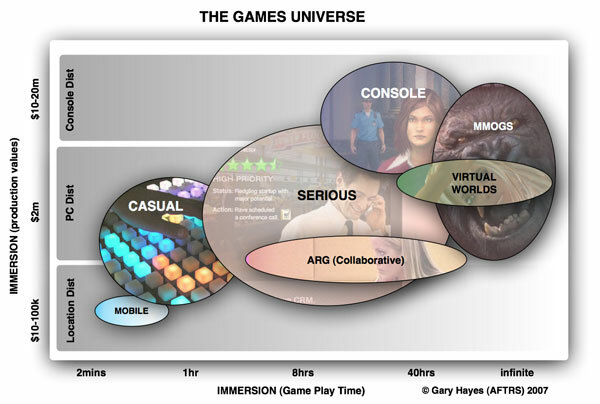 It’s interesting that you include virtual worlds in the same chart as games. I think it’s a conceit of virtual world enthusiasts that more time spent inworld indicates greater immersion–this is too simplistic. There are lots of reasons people spend time in There, Kaneva, or Second Life: Some people are looking for something to do, but aren’t finding anything of interest. Some people log in to communicate with friends or coworkers. Some are curating a build or installation. Some are waiting for others to show up. Not every minute is an immersed minute. Even in story-based game worlds such as Warcraft, where one might spend as much time at the auction house and answering guild messages as fulfilling quests. I love the infinite portion at the end of the chart. It shows how immersive games can actually steal all of a person’s time, even while working, napping, eating and sleeping. The Mixed Reality Perfect Storm Corporations in Social Virtual Worlds – Psychopaths or Welcome Friends?